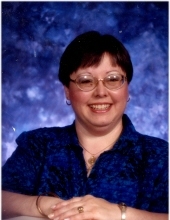 Connie Ann Pitcher, age 60, of 13th Street, Hamilton, Ohio departed this life on Sunday, February 3, 2019 at Bradford Place in Hamilton, Ohio. She was born on April 3, 1958 in Corbin, Kentucky to Clinton West and Bonnie Nell (Meadors) West. She is survived by a son, Anthony Joseph Pitcher II (wife Stacey) of Hamilton, Ohio; grandchildren, Shelby Lynn Pitcher, Ana Stacia Josephine Pitcher, and Asher Pitcher, all of Hamilton, Ohio; parents, Clinton and Bonnie (Meadors) West; brothers, Richard Eugene West of Hamilton, Ohio and Patrick Clinton West (Stephanie) of Hamilton, Ohio; sister, Geena Mays (Terry) of Lily, Kentucky; best friend, Lynn Butterfield and son Eric; special friends, Molly and Paula of Hamilton, Ohio; aunts, Ann and Bill Sye of Pennsylvania, Flossie and Mike Birnbaum of Las Vegas, Nevada, Ruth Shelton of Tennessee, Roxie Cotton of Cincinnati, Ohio, Hettie Siler of Williamsburg, Louella Shelly of Michigan, Thelma McWilliams of Williamsburg, and Joy West of Williamsburg; uncles, Onnie and Betty Meadors of Williamsburg, Charles Meadors of Georgia, Eugene and Sue Meadors of Williamsburg, Dennie and Mary West of Williamsburg, and Roy and Linda West of Williamsburg; and a host of other family and friends to mourn her passing. Visitation will be after 6:30 P.M. Friday, February 8, 2019 at Croley Funeral Home. The Funeral Service will be at 9:00 A.M. Saturday, February 9, 2019 at the Croley Funeral Home Chapel with Rev. Larry Peters officiating. Following the Service she will be laid to rest in the Meadors Addition of Concord Cemetery. In Lieu of Flowers, Donations may be made to the Diabetic Association of Hamilton, Ohio. To send flowers or a remembrance gift to the family of Connie Ann Pitcher, please visit our Tribute Store. "Email Address" would like to share the life celebration of Connie Ann Pitcher. Click on the "link" to go to share a favorite memory or leave a condolence message for the family.